Elementary. 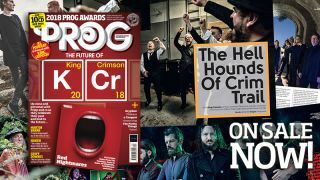 It's King Crimson on the cover of the new issue of Prog! The new issue of Prog is on sale today. With King Crimson currently touring the nation's concert halls, we catch up with the band to discuss the new tour and their impending 50th Anniversary. There's new and exclusive interviews with the band and some brilliant photos, courtesy of bassist Tony Levin no less, which show the band in a whole new light. AND, Prog Awards host Al Murray travels to Pompeii to see the band perform in the legendary historical venue. Prog Awards - eight pages of all the stories, the guests and the winners from Prog's big night at the Underglobe. Martin Barre - the guitarist proves there's life after Tull with his latest solo album. Haken - with new album Vector under their belts the British proggers look back over the last decade. Geoff Downes - the Yes and Asia man looks back over a great career in The Prog Interview. The Tangent - Andy Tillison reveals how prog and punk make their mark on the band's new album. iamthemorning - The Russian duo on making beautiful art in a remote studio in Norway. Phideaux - the multi-instrumentalist finally completes his dystopian trilogy. Thumpermonkey - There's less noise and more art on the London quartet's fine new album. VOLA - The Danish proggers are ready to lap up the applause with album number two. Voivod - Canada's prog metal veterans hit a rich vein of form with new album The Wake. Black Peaks - Young Brighton prog metallers come on like a polished Mastodon on new album. Von Hertzen Brothers - Mikko Von Hertzen reveals his prog life in My Prog. Gryphon - Dave Oberle reveals how the legendary proggers returned to active duty. Plus live and album reviews from Steven Wilson, Muse, Jean-Michel Jarre, Flower Kings, Jethro Tull, Opeth, Summer's End, Steve Hackett, Nick Mason, Sons Of Apollo and more. And music from Voices From The Fuselage, Arabs In Aspic, Pymlico, 69 Windmills and more on the CD.